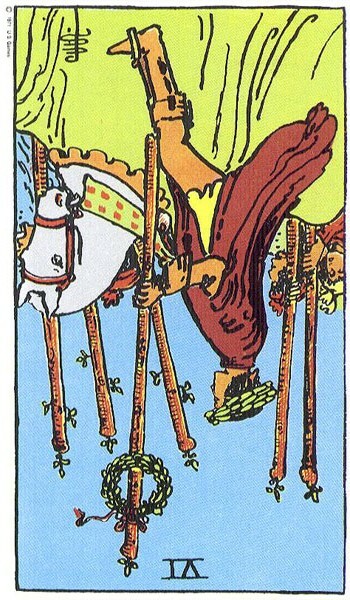 Card for the Day: Six of Wands–Reversed! Nobody understands. Awww. We all have days like this, and there’s something sort of childish and sweet about them. We ought to be paraded in the streets, or at least recognized and acclaimed, for our accomplishments and wisdom. Instead, people not only aren’t appreciating our special genius, but they are misunderstanding it entirely–and fussing at us for the very acts we most wanted them to appreciate. This is the day when you go out to get donuts for breakfast as a special surprise, because you are trying to be sweet and thoughtful, and instead your spouse fusses at you because you are both trying to lose weight. It’s okay. You meant well. And in time, everyone will realize that–and maybe they’ll realize that your vision was right, all along. But even if they don’t, they will still love you. Those tender, misunderstood gestures may continue to be misunderstood, but the tenderness will still come through if you keep at it. I am at a loss as to what to say!